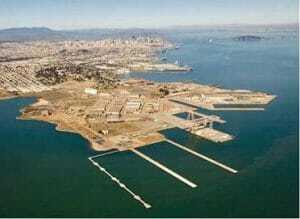 Gilbane Environmental has won a contract to develop a remedial design and perform remedial action phase two for soil contamination within portions of Parcel E at the former Hunters Point Shipyard located in San Francisco, CA. The $26 Million project includes conducting an excavation at the shoreline; constructing shoreline protection features to protect the backfilled shoreline excavation; implement in-situ stabilization within the non-aqueous phase liquid treatment footprint; constructing a groundwater containment slurry wall; maintain radiological controls in work areas; and perform waste characterization and stockpile for disposal or reuse. The period of performance is for 36 months. The performance objective is to achieve the remedial action objectives and remedial goals for soil within IR-03. Gilbane has worked at Hunters Point for over 15 years and is working with the Navy to transfer this base to the City of San Francisco.